When I woke up yesterday morning, I had no idea that by evening I would be going to see John Hodgman and meeting the man himself at the end of the night. And that he would offer me a sandwich and cheesecake. 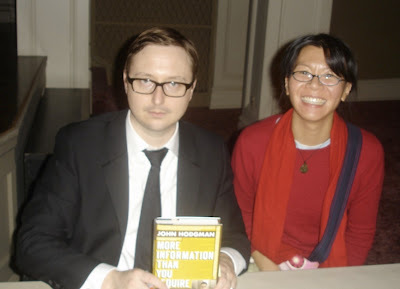 My friend Rachel had heard on NPR yesterday that John Hodgman would be speaking at Town Hall that night. She gave me a call, and we both purchased the $5.00 tickets, soon to be sold out. For those you who do not watch the Daily Show or listen to NPR, you will know John Hodgman as the PC guy from the Apple commercials. Indeed, he is "a famous minor television personality" and general expert of all things. It was a very entertaining and funny night. I haven't laughed so much in a while. 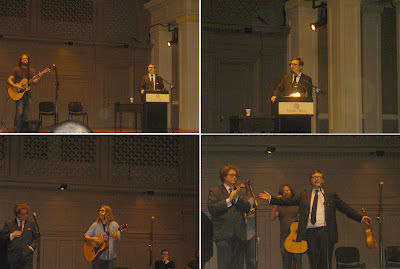 As a bonus, we were treated to informal performances by Harvey Danger/The Long Winters members, Sean Nelson (on the left) and John Roderick (on the right). 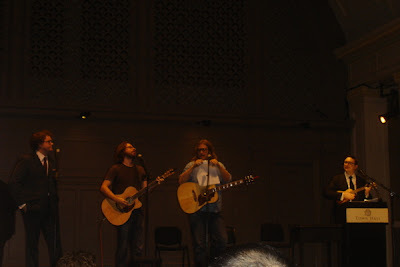 The guy in the middle is a singer from New York, Jonathan Coulton. I remember going to see Harvey Danger in Cleveland about ten years ago. 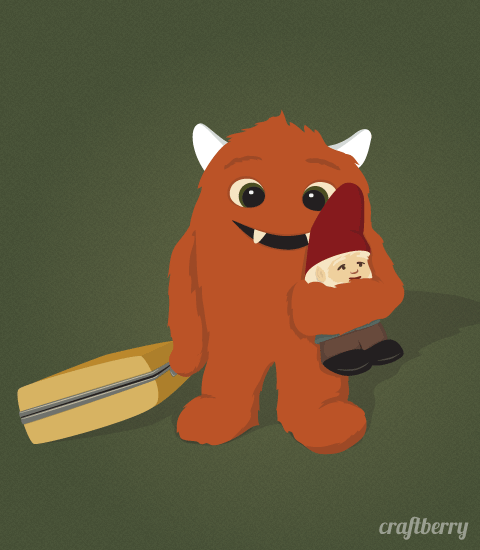 I can't believe it's been ten years. This is John Roderick about to play a musical solo on a piece of paper. We waited about an hour (I think) afterwards to get our books signed. We were at the very end of the line, hungry and tired. They had brought out some food right as we got to the table. John was very cordial, shook our hands, sat for pictures and offered us some cheesecake, pho or sandwiches. We were so hungry, rachel and I both snatched a sandwich and left pretty happy. So I'm now addicted to your blog, and had to let you know that I LOVE Jonathon Coulton...have you listened to his remake of Baby Got Back? It's freakin' hilarious...I've got a link to it on facebook. Hope you're well! !